In this article, we will tell you how you can change the name of the delivery service when using the WooCommerce FedEx Shipping Plugin with Print Label. This should help you show the desired shipping service name to your customers on the Cart and Checkout page. Our WooCommerce FedEx Shipping plugin allows its users to change the shipping name on the settings page. This is a very useful feature for the store owners who want to show custom FedEx names to their customers. Many store owners do that in order to make their customers figure out the FedEx service in a better way. For example, store owners can rename the FedEx Ground Home Delivery to FedEx Doorstep Delivery to make it sound more convenient for the customers. 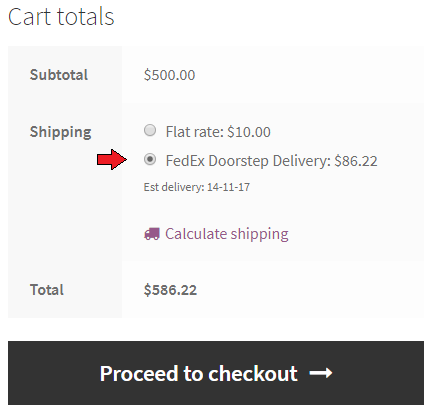 But this feature can only be used by the store owners to show it on the WooCommerce Cart/Checkout. You can see the following screenshot of the FedEx Doorstep Delivery for the reference. You cannot use this feature anywhere else. Let us take an example to understand this feature’s limitations. Vimurtanada: When creating a shipment, it will be convenient for me to see the “Name” of the Shipping Service (that I have assigned in the Settings) instead of the “Service Code.” Please let me know how to do this. Here, Vimurtanada wants to see FedEx Economy in the place pointed out by a red arrow in the following image. You see, this feature does not do that because the process used by our plugin to create order label is mapped to the FedEx service codes. Doing any changes in that might cause an error which is not desirable. Moreover, the shop owner should be careful while selecting the right service and generating the labels. The default name helps customers to see the service name as per the custom name. This is a common requirement for many of our customers. We hope this article answers your questions and help you in some way. Let us know in the comment section below.